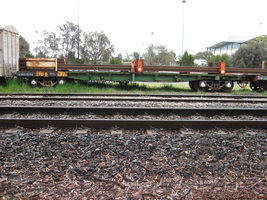 Narrow gauge flat wagons, which were classified "NRH" and allocated road numbers 1466 through 1471. These vehicles were part of an order for 36 standard gauge "RG" class wagons. 30.4.1964 Entered service as narrow gauge flat wagon "NRH 1466". 1.1978 Converted for use as rail roller wagon "RGD". 28.2.1964 Entered service as narrow gauge flat wagon "NRH 1467". 5.1981 Noted as fitted with work hut "QU-1-146". 21.2.1964 Entered service as narrow gauge flat wagon "NRH 1468". - Converted for use as rail roller wagon "RGD". 4.4.1964 Entered service as narrow gauge flat wagon "NRH 1469". 14.1.1987 Converted to "AFGF 3221". 12.3.1964 Entered service as narrow gauge flat wagon "NRH 1470". 21.2.1964 Entered service as narrow gauge flat wagon "NRH 1470".